Baptism is a gift of God! The Moravian Church has two sacraments: Baptism and Communion. As a pastor I am almost always the officiant and worship leader when either of these two take place. Don’t get me wrong, as I stand robed in my surplice (the liturgical garment worn by moravians upon administering the sacraments) I am aware that I’m standing on Holy Ground. There are times that I’m moved to tears as I share the body and blood of Christ or offer the words of blessing over the waters of baptism. These moments of ministry are life giving in many ways. Regardless of how moving these moments are there is little that prepared for the the two times I’ve stood on the other side of Baptism. The first moment was at my son’s baptism. He was 13 months old when Bishop Burkette poured the waters of baptism over him. Baptism that day was his formal welcome into the Christian Church (at that time we were serving at First Moravian Church of Georgia) and it was also a binding time for our family as his adoption had been made final just 2 months before. With both my husband and I being ordained clergy, either one or both of us could have baptized our son but we wanted to be mommy and daddy in that moment. We wanted to stand with the sponsors we had chosen and proclaim the covenant of baptism with and for him. Bishops in the Moravian Church’s primary function is to be a pastor to pastors and so we found it appropriate to ask Bishop Burkette to participate in this special moment. My littleman is now 7 and I marvel at all he has learned about the unconditional love of God and Jesus’ life, death, and resurrection. The second time that I stood on the other side of the baptismal font was this past Sunday as my husband and I were Godparents for some dear friends (who are also a clergy couple). I was so excited and honored to be asked to be this sweet little girl’s God-Mother. I didn’t really think this moment would come – after all I’m usually the officiant. 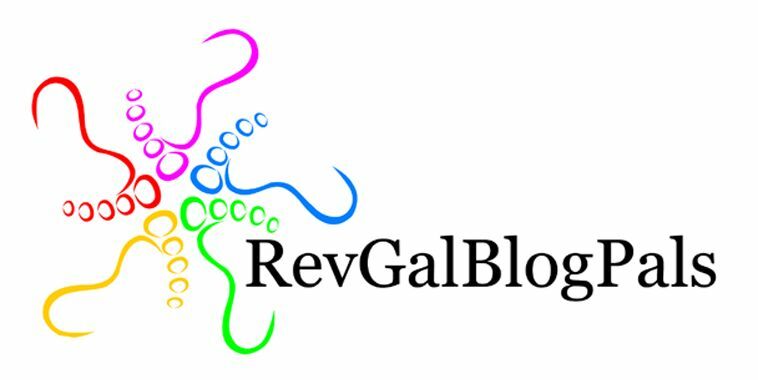 The week prior to her baptism was tough for me, I was hurting and exhausted. I was recovering from the events of Holy Week and Easter. On top of that we were hosting the Board of World Mission of Moravian Church at our church for their bi-annual meeting. Folks from both the Northern and Southern Province of the Moravian Church (as well as our partner provinces, folks from Guyana, Costa Rica, Honduras, Nicaragua, Cuba, the East West Indies, Labrador, Tanzania) filled our fellowship hall and on Saturday evening filled the back yard of the parsonage as we gathered around an outdoor fire for fellowship. So what does this have to do with being a God-Mother? Six hours of travel! Her baptism was to be held in Ohio and we live in North Carolina. I was torn, I wanted to be there but I knew that wasn’t a practical option. Saturday evening great JOY filled my heart as I exchanged text messages with her parents about how we would just “Skype” us in, allowing us to be “virtually” present. Then I said, “why not use FaceTime?” We all had iPhones and it would be so easy to do it that way rather than mess with a computer. 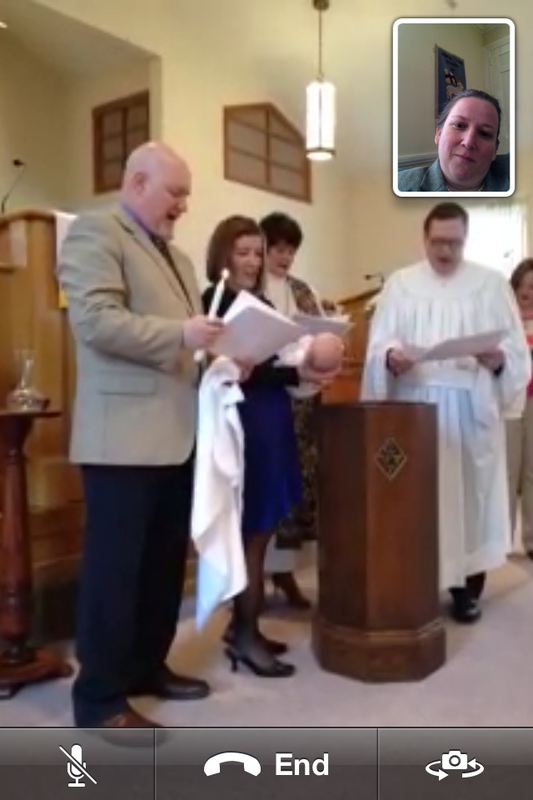 After consultation with the Bishop that was officiating at her baptism we agreed that near the end of the sermon they would FaceTime me. It was during the beginning part of our scheduled worship at Fries, so I sat in the living room of the parsonage, while my husband began worship and waited for my phone to ring. As soon as it rang I felt transported to Ohio. I heard the concluding part of the sermon and was present through the baptismal liturgy. As Bishop Sapp asked: “As you present yourselves before God and this congregation, we call upon you to profess your faith. Do you believe in God as your Creator and loving heavenly Father, in Jesus Christ as your Savior and Lord, and in the Holy Spirit as your Comforter and Sustainer, according to the Holy Scriptures?” I was able to say “I do”. With that our call came to an end – I wiped the tears from my eyes, took a deep breath and walked from the parsonage to church thinking – “Wow that was awesome!” I entered into worship, that had already started, and took my place up front. When it came time for congregational prayer, I was almost speechless as I tried to share how awesome it was to be able to “be” at her baptism. By doing so I feel as if I shared her baptism with another Moravian church and the energy after worship was like that when a child in our congregation is baptized. Folks were excited and I showed them a couple of screen shots of the conversation. In closing, I say that even though I wasn’t there in person for her baptism, I was present in spirit and just as i was only a FaceTime call away to be with her at her baptism, I’ll only ever be a FaceTime, email, or whatever new means of communication are bound to come up, away whenever she needs me! What an amazing and awesome experience!